I had a big taho craving today. 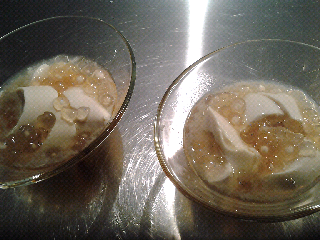 Several blogs posted a few interesting taho quick fix recipes but I decided to follow the recipe from "Panlasang Pinoy". It is very easy to make! I didn't make my arnibal though but used maple syrup instead. The key ingredient is the soft or silken tofu and the tapioca balls. I boiled the tapioca balls for about 1 hour then put in on top of the silken tofu that I heated in the microwave then poured a generous serving of maple syrup and I have my taho! Brilliant! Yummy! sosyal naman ng taho mo! pati lalagyan hehehe. siyempre naman! it is all in the packaging. 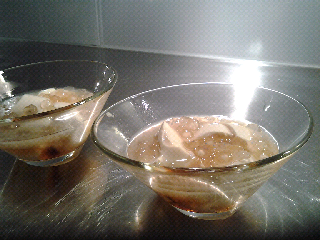 =) Gourmet taho! Looks yummy! I miss taho...am afraid to buy from street vendor.